arnoldsche Art Publishers, Stuttgart, Daniel Kruger, Berlin, and the authors and translators ©2017 ISBN 978-3-89790-492-8. Ceramic can be the principal feature, but it can be incidental too. Even when it occupies the heart of a museum, park or table, a vessel can be ornament, sculpture, or simply a focus of attention. If we have the modern era begin with the 18th century Enlightenment, then modernity discovered ceramic and reflection at the same time. This is because ceramic produces objects, but also artworks. Accordingly, reflection is thinking, but also imagination. Or reflection finds remote meanings precisely in what is closest, in the plates off which we eat, for example. 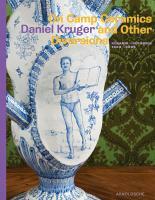 Every ceramic by Daniel Kruger can be related to Antiquity. In 1993, the artist himself says: ‘What I found interesting as a notion was the way classic models were repeatedly being copied and look different again and again. The way they reflect the time in which they were produced, despite efforts to reproduce the time from which they were taken. The ancient shapes and patterns become a support for new ideas.’ Even when Daniel Kruger affixes cars or fighter planes to vases, or uses stones, balls and bones in centrepieces, there are still threads, such as Roman iconography or Baroque allegory, which tie the modern with the ancient age. And even when vases and occasional tables strike tones that are familiar from China or Africa, these tones resound in the Mediterranean region of Europe. Those expecting eternal youth will see Daniel Kruger’s spontaneous and voluptuous modelling frozen in these ceramic still lifes. ** But allegorical expression is not just visual expression; it is an alternative expressive form above all. This can mean having Antiquity recreated in something other than an energetic Renaissance image. In one centrepiece one finds a football, around which stones are placed in a dish (see p. 210). Alternatively, the stones are vaulted by the football’s sphere, like incidental cupolas of a principal cupola. Daniel Kruger’s early services are similarly centred and arranged. In seemingly endless variation, the same shape can be found in Daniel Kruger’s jewellery too.